The year is 1941. Germany has defeated Poland, Denmark, Norway, and France with ease. In the morning hours of June 22 over 3 million German soldiers attacked Soviet forces along a 1600 kilometer front heralding the beginning of Operation Barbarossa. The Germans achieve complete surprise striking deep into Soviet territory. The German High Command thinks the Soviets will fold like a house of cards; Stalin has massacred the Soviet officer cadre, training is poor, and their troop morale is low. To bolster this perception the Soviets proceed to lose over 1.75 million men during the first two months alone. The Germans are unstoppable, their Panzers pushing to the very gates of Moscow. But then winter hits, and the bitter cold saps the German's of their resources, strength, and morale. The Soviets strike back and the momentum of war begins to shift. The Soviet bear had awakened! 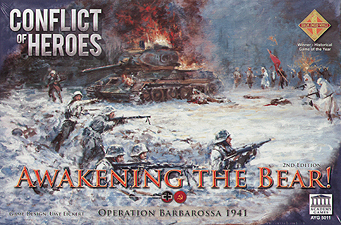 Conflict of Heroes (CoH) games follow the evolution of modern tactics, from WWII to the present. CoH games follow the evolution of modern tactics, from WWII to the present. C0H features a fast and fluid system that is easy to learn but realistic to all of the unique theatres of battle portrayed. Fun: Quick-paced simultaneous play allows players to interact without waiting. 5 beautiful, highly detailed 15x19 inch geomorphic mounted map boards that can be integrated with the maps of other CoH games. 210 Large 1" square die cut counters depicting rifle and SMG squads, tanks, armoured cars, anti-tank guns, mortars MGs and many more. 1 programmed instruction rule book that teaches the game in small easy to learn steps. This is a nice game, it has nice component, thick card map tiles and counters and it is simple enough that you can teach it to non wargamers quite easily. On a players turn they activate a unit which gets 10 action pts (APs) to spend on doing stuff, like moving or firing etc. But there is also available a pool of command action pts (CAPs), usually 10 but decreases as units are destroyed which can be spent by any unit at any time. The basics are simple and familiar yet there is a flexibility to the system that allows quite complex interactions on the board due to how the CAPs and APs are spent. For example a player may activate a unit and spend Aps to move, his opponent reacts to the move by spending CAPs to activate any other unit on the board to do something, which can be reacted to again by the activating player who can also use CAPs to activate another unit, before the activating player continues with his initial unit which is using its APs. Needless to say the game is very fluid and relatively quick to play. The scenarios in the game start off very simple and increase in complexity with new rules being introduced in each scenario to help teach the game in a gradual way, however this does mean that you have some of the early scenarios being a little threadbare and not really offering so much replay value. It would have been nice if there was ascenario building system in the game similar to the one in Combat Commander Europe. If like me you have ever fancied dipping your toes into wargaming and are looking with an easy to understand yet strategically interesting game to play then you cant go far wrong here. Its a sizeable step up from memoir 44, but not quite as complex as Combat Commander Europe.